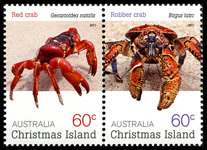 The land crabs of Christmas Island are remarkable for their abundance and the role they play in the ecology of the island's rainforest. 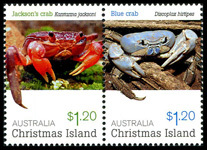 Christmas Island is home to twenty-three land or freshwater crabs. The 60c and $1.20 stamps are issue in se-tenant pairs. The left hand stamp in each pair appears in columns 1, 3 and 5, while the other stamp in the pair appears in columns 2 and 4.